Dusk is the time to live in a dream world. That one brief time of day feels as if it is caught between reality and potential. Blink and you miss it. Blink and you are caught in the same endless cycle of stresses and schedules, homework and dishes, alarm clocks and bedtimes. If you stop, if you stop and look at the sunset, you notice how the world changes. It slows down for a moment. 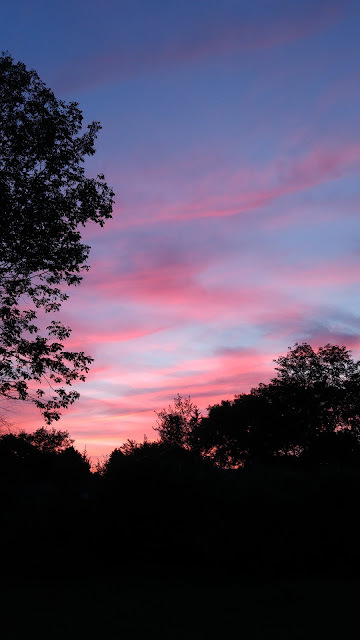 All you see is the softened edges of the graying world, the swift flight of the swallows across the yard, and the haze of pink and indigo across the sky. The world is full of potential. Maybe you will write that book or paint that picture, or take that trip. No more for you the everyday routine of life. You, you are going to do something. The sunset fades and the quiet is supplanted by the everyday sounds of life, a child complaining about chores, the murmur of the radio upstairs, the clatter of dishes in the kitchen. You turn and leave that pink and indigo dream world and enter back into the world of noise and commotion. You realize that once the world you dreamed about is the world you have now. You just didn't know it came with so much whining and nagging and so many dirty dishes. That's the thing with dream worlds, the work is left out but so is the love. Dream worlds are softened and grey and hazy. Real life is noisy and chaotic and brightly colored. Dream worlds fulfill all your wishes. Real life fulfills wishes you didn't know you had. It is messy and wonderful. It is boring and unexpected. It is full of laughter and tears. It may not always live up to your dreams but sometimes it exceeds them. That's life. That's real life. But sometimes we need to gaze at a pink and indigo sky and dream.